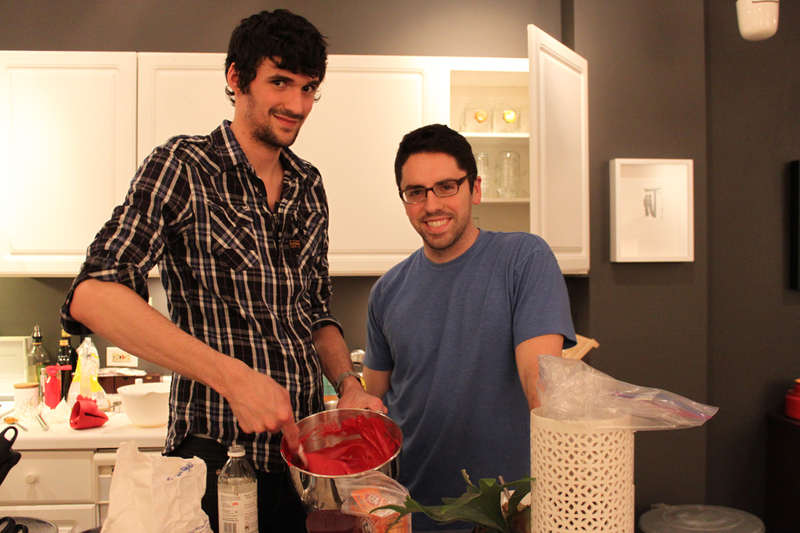 Tommy made Michael his grandmother’s Red Velvet Cake for his birthday dinner. I received a gift too – he gave me permission to post the recipe! I had to leave it in its original form. I love the funny language in recipes sometimes – for instance when it says “Last step. Be ready for this one.” I’m not sure if those are Tommy’s words or his grandmothers but they are what makes cooking and sharing recipes so fun. Thanks Tommy! 1 cup sour milk * To sour milk add 1 tbsp lemon juice to milk. Cream shortening, sugar, and eggs. Add food coloring and vanilla. Sift together: 2 ¼ cups of flour, 1 tsp salt, and 2 level tbsp of cocoa . Add sifted ingredients alternately with 1 cup of sour milk to the creamed mixture. batter by hand. Do Not Beat. Bake at 350* for 30 – 35 minutes. 3/4 cup milk – heated warm ahead of time and then let it cool to room temperature. Beat the shortening, sugar, margarine, and vanilla for ten minutes until fluffy. Slowly add ¾ cup cooled milk. * Icing will melt if left out at room temperature. Keep cake refrigerated. That is the strangest cake recipe I have ever read. The icing is even more strange. this is very similar to my family recipe for “crazy cake” – a chocolate cake that you mix in the same pan you bake it in – no red food coloring in crazy cake tho. crazy cake is an old farm recipe and i bet edith’s is too – i think that’s where the original “cooled milk” requirement came from – when the milk comes out of the cow – it’s not cold! The recipe does come from a farm… I never really thought twice about it though haha.